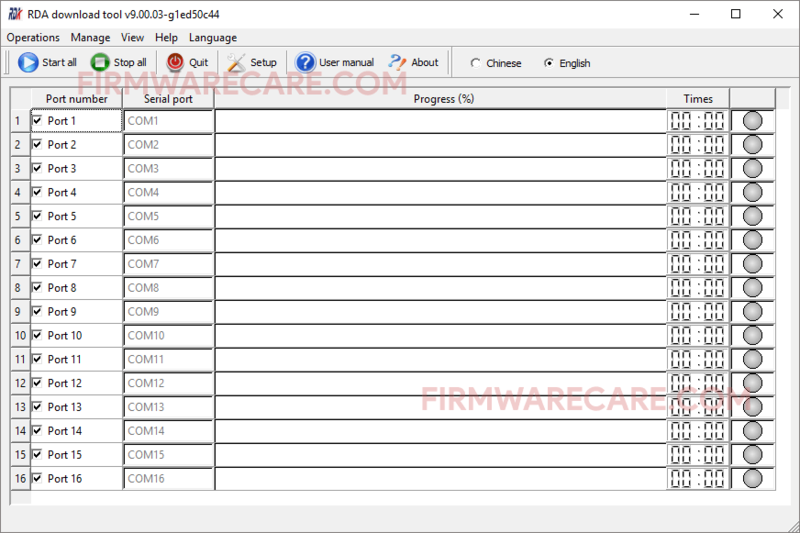 RDA Download Tool v9.00.03 is a small application for windows computer created by RDA Mobie Inc, which allows you to flash the stock firmware on your RDA chipset powered Android Smartphone, Tablets and Feature phone. It support flashing of the stock firmware of on 15 devices at once. Firmware can be flashed on 15 devices at once or on a single device. The tool is available in two languages i.e English and Chinese. User can choose the language from the menu bar option. The tool comes with the user manual which helps you to understand the tool and also helps you to flash the stock firmware on your RDA powered Android Device and FeaturePhone. In order to use the RDA Download Tool, you need to install the Universal ADB Driver on your computer. [*] Compatibility: The RDA Download Application runs perfectly on Windows XP, Windows Vista, Windows 7, Windows 8, Windows 8.1 and Windows 10 (32 bit and 64 bit). [*] Credits: RDA Download Tool is created and distributed by RDA Mobie Inc (developer). So, full credits goes to RDA Mobie Inc (developer) for sharing the tool for free.